To create an effective woven fabric a process engineer must choose the appropriate type of weaving machine and determine the particular parameters of the elastic system of fabric formation to be applied. It is also essential to know the purpose of all the mechanisms of the chosen type of weaving machine. This title provides an important, indispensable reference for both weaving specialists and students. Mechanisms of flat weaving technology introduces the reader to the classification of different types of weaving machines and the basic mechanisms involved, leading to a discussion of the principles and mechanisms of warp release (warp let-off), while also providing a description of the warp shed. 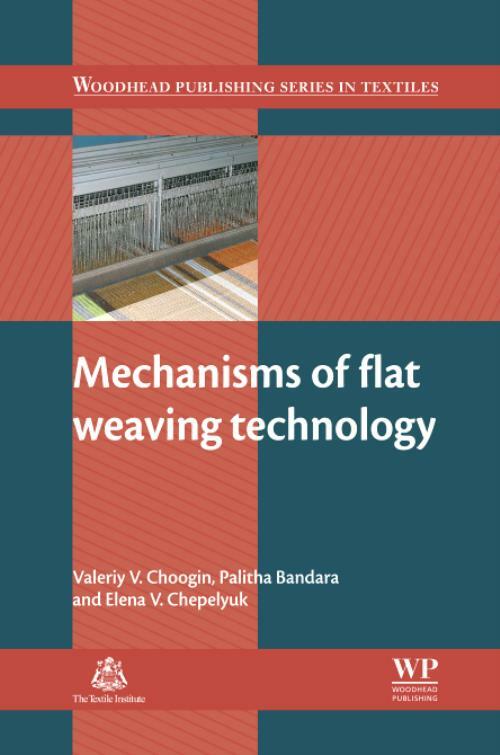 The book reviews how the supply of weft is maintained on a weaving machine and describes the different methods of weft insertion used on weaving machines. Woven fabric formation is described alongside the characteristics of fabric take-up from the working area and its winding on the cloth beam. Later chapters describe safety (protective) devices provided on woven machines, and the different types of weaving machine driving and stopping mechanisms are presented. The authors then discuss ways of estimating the optimal parameters of weaving machine settings, whist describing methods for the evaluation of the quality and the quantity of the woven fabric produced. Finally, transportation of raw materials and outputs within the weaving factory are described. The book also includes an in-depth glossary and full bibliography. Choogin, Valeriy VValeriy Choogin is Academician of the Ukrainian Technological Academy (UTA) and Professor in the Department of Mechanical Technology of Fibre Materials, Kherson National Technical University, Ukraine. Bandara, PalithaPalitha Bandara is Associate Professor in the School of Design, University of Leeds, UK. Chepelyuk, Elena VElena Chepelyuk is Professor and Head of the Department of Design, Kherson National Technical University, Ukraine.